Contex solutions are recognized in a wide range of industries for reliability, value, high performance and superb image quality. 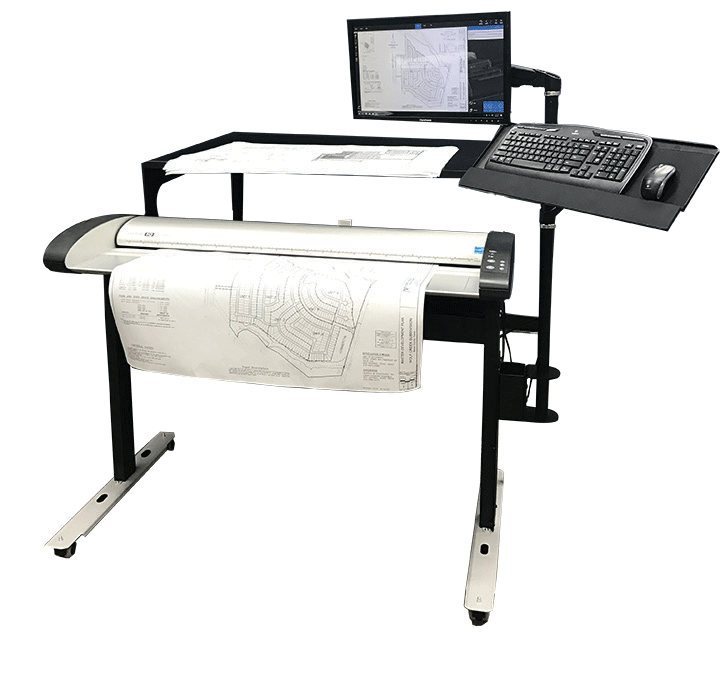 The Zero Turn Scanning Productivity Center is a single footprint holding table for “to-be-scanned documents”, a receiving table for “scanned documents” and a flat panel display with keyboard/mouse tray. The document handling system utilizes vertical space to achieve one touch document handling. Achieves “a touch once” document handling environment for the scanner operator. A professional, non-invasive approach to providing the operator with visual confirmation of scan file quality and easy access to documents, keyboard and mouse. Operator can easily load documents into the scanner without losing line of sight to their display monitor. The one-piece vertical design maximizes the use of floor space. Only occupies 25 sq. ft. including the scanner, flat panel display, and keyboard/mouse tray. Includes left or right mounting adjustable gas spring pole bracket with wireless keyboard and mouse and 22″ color monitor. PC sold separately.